Have you ever been to a pet birthday party? For animal lovers, this is probably one of the most fun things you can do. Much like a child’s birthday, these memorable events not only celebrate a pet’s life, but the meaningful contributions to their owners’ lives as well. If this sounds like something you’d like to do for your pet, the Pet Experts have some tips to get the party started! If you’re uncertain of your pet’s actual date of birth, don’t worry! Celebrate the date they were adopted, when you brought them home, or another meaningful date. 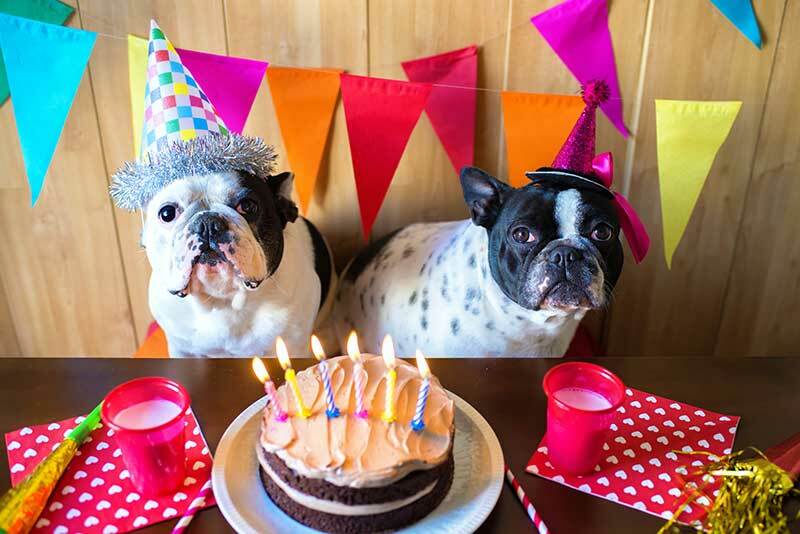 Obviously, throwing a pet birthday party sounds fun to us, but does your pet agree? Your gathering will only be successful, safe, and fun if your pet is fully trained, socialized, and enthusiastic about guests descending upon their territory. A typical pet birthday party will have both human and animal guests. Is your pet amenable to having the pets of your human guests in attendance? The answers to these questions will be instrumental when planning the event. If your pet is well-behaved around others, forge head. Before you get ahead of yourself, are kids going to be part of the party? For everyone’s safety, inform parents that children must follow established rules. If necessary, ask that pet owners keep their pets on leash to avoid possible scuffles among (and beyond) their own species. A pet birthday party at home is possibly convenient, but can your place accommodate all your guests? If not, a public park, doggie day care, dog park, or other pet-friendly/outdoor location may tick off all the boxes for your event. Having outside access is necessary for obvious reasons, but can also come in handy for planned (or spontaneous) activities. Encourage your guests to play fetch, Frisbee, hide and seek, practice yoga together, set up a little beauty salon, or play Simon says (test the obedience skills of all the pets in attendance). One of the best things about a pet birthday party is, of course, the food! Since animals are highly motivated by treats, make a game out of enjoying some fresh veggies and fruits. Also, when it’s time for your pet to “blow out the candles” on their cake, invite all the pups to get involved. You won’t want to leave your camera behind! To ensure everyone enjoys the event, carefully consider your guest list. If you’re concerned about a guest, simply have a discussion about alternatives. Perhaps you can schedule a puppy play date with that owner and dog another time when there aren’t as many other people and pets in attendance. Be sure that everyone closely supervises their pets and kids, intervenes before troubles start to brew, and leaves on time. Overstimulation or over excitement can lead to accidental injury. .
A large pet birthday party may not be every pet’s jam. Cats, for example, may prefer a quiet cuddle at home instead of having lots of strangers singing in their face. Whatever the case may be for you and your pet, we hope that you have fun celebrating their impact on your life. Please let the Pet Experts know if you have any questions or concerns! Good luck! Previous: The Real Deal: Is Pet Insurance Worth It?